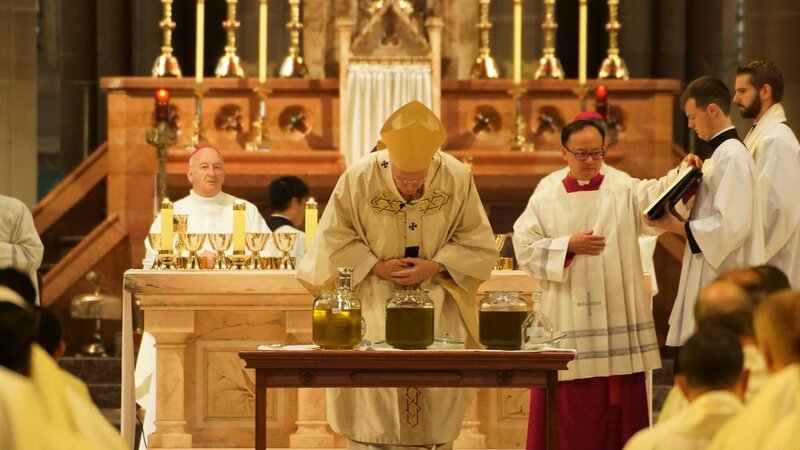 Once a year, the priests of the Archdiocese of Melbourne gather together with the bishops to celebrate what is known as the Mass of the Holy Oils or Chrism Mass. Usually occurring on the Tuesday of Holy Week for the Archdiocese, it gets its name from the part of the liturgy where the Archbishop blesses the three sacramental oils of the Church to be used for that year- the oil used in the Anointing of the Sick, the oil of the Catechumens and the Oil of Chrism. This year, on Tuesday 11 April, the Archbishop concluded his homily by quoting and explaining the poem 'Aaron' by George Herbert after thanking and exhorting the priests to continue working to build up the Kingdom of God. As part of the liturgy, the Archbishop invites the priests to renew their vows and also asks the people to pray for their priests. While Mass continues, the oils are bottled by a dedicated team who organise them to be distributed to the various parishes and priests around the diocese for their use in ministry. The oils are individually poured carefully into little bottles through the use of large vats. Following the Mass of the Holy Oils, the priests of the Archdiocese gathered together to celebrate and connect with other priests over a meal. This was a memorable occasion where the priests get together to share the stories of ministry, remember those who have passed, meet those priests new to the Archdiocese and reconnect with old friends. This year in particular, the Archbishop requested the priests to remember those devastated by the recent storms in particular by Cyclone Debbie, and asked the priests to join him in prayers for those who have suffered, and to join with the Archdiocese to assist the bishop of Lismore in his efforts to purchase mattresses for those who have lost their homes by participating in the appeal set up. 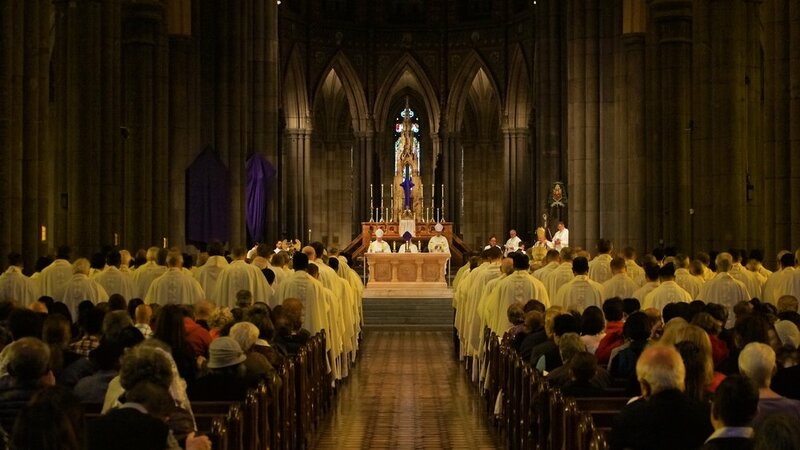 It’s a wonderful occasion where the brotherhood of the priests is reaffirmed and strengthened both within the diocese with their bishop and people, but also with their brothers and sisters in the various diocese across our country. This article was originally published by Melbourne Catholic at http://melbournecatholic.org.au/News/2017-mass-of-the-holy-oils.